We have a real problem here with wild birds eating our seedlings. They love broccoli, lettuce, beans, beetroot, silverbeet, corn – they even pulled out some of our onions and garlic! Don’t get me wrong, I love the birds – satin bowerbirds and purple swamphens are the main offenders – I just wish they’d leave our gardens alone! Time for some defence structures. I did a bit of thinking and some online research, and decided to rig up some simple bird nets over the beds. I cut 50cm (~18 inch) lengths of concrete reinforcing bar (“reo”) and drove them partially into the ground around the garden bed, just deep enough so that they were secure. I got the reo bars from the garbage tip – 8x 2m bars for $5. I love the tip shop! The beds are 1m (3 feet) wide, and I placed the reo bars about 1.5m (5 feet) apart along the length of the bed. Next I cut 1.8m (6 foot) lengths of 19mm (3/4 inch) poly irrigation pipe, and formed arches across the bed between opposing reo bars. They were surprisingly sturdy. I bought some 4m x 4m (13 foot square) bird nets from Bunnings (about $5), and cut them in half so they’re 2m x 4m. This length and width nicely spans the bed and covers 3 pairs of hoops (i.e. a 3m (10 foot) long bed), with enough left over at the ends to reach to the ground. I cut up wire coathangers to make the pegs, and pinned down the sides and ends of the bird nets. As you can see in the photo below, the end hoops get pulled inwards a little. I’m going to hammer in some tomato stakes to hold them up straight. The end result looks pretty good, and so far is working really well to keep the birds out. They keep the free-ranging chooks away as well. 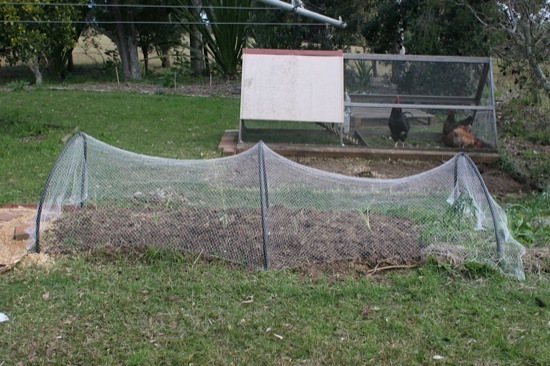 Of course, these bird nets will only be good for low-growing plants (lettuce, broccoli, carrots, beetroot, strawberries, etc). I’ve built a different kind of net structure for the tall stuff like corn and tomatoes – but that’s another story. If you have a choice, the white bird nets seem to be better for this stuff. Black nets look nice because they’re almost invisible, but that means that the birds can’t see them and they’ll get tangled up. Then you either have unnecessary slow deaths, or the thankless task of trying to untangle an ungrateful bird while avoiding its beak and claws. How do you protect your gardens from birds? I’d love to hear about other cheap and simple solutions! I hadn’t thought about the colour of the nets before! But you’re so right, the very reason black seems attractive to us is the same reason it doesn’t really improve the situation. @JulieG: I didn’t realise the colour mattered either, until a friend pointed it out to me! Makes sense, though. My main bird problem has been with Blackbirds. They love digging for worms in the most inconvenient places. They redistribute the mulch burying seedlings in the process. At times they have also, almost, uprooted established shrubs as they dig completely around the trunk of the plant – especially after watering. We have to net our berries but were too late with the blueberries last summer and lost our first half-decent crop. I have now started to use bird netting over my cabbages and broccoli – to see if it helps reduce problems with caterpillars. The net (hopefully) will keep the butterflies out so no eggs can be laid. @Tim: We bought some nylon lace curtain material at the second-hand markets to try over broccoli plants. It’s fine enough to exclude butterflies and moths, and was very cheap. I suspect they might be able to get through bird netting, though. You need a sturdy wire mesh, around a metre wide. Less cheap than net, but very durable. 2.Cut lengths, I’d imagine about 2.5 metre, enough to make an arc of the desired height. Attach flat ‘side panels’ of the same wire mesh to either side of your arc, and cut off excess. You now have a wire mesh dome which holds its shape and is easy to lift and move. Works well for us, though I’ll certainly try your design for beds we don’t need to access so often. Funny how in some areas birds are no problem; in others, they can destroy everything you plant. Here is a thought. Because cabbage moths look for the shape of the cabbages/broccoli etc. maybe the white bird netting will confuse them? The net looks fine. 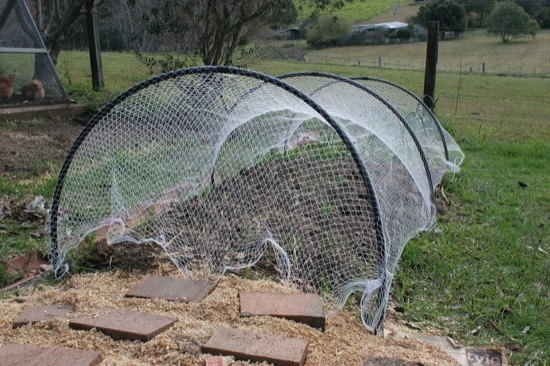 I also bought a net for my vegetable garden but still got no time to install it. But this one looks good, thanks for giving me an idea. SOLUTION FOR BLACKBIRDS Get a bunch of worms from your compost heap. Place the worms in a very strong solution of ROGOR (they will die in seconds). Let soak for half an hour. Rinse worms & spread them around the blackbirds’ favourite digging places. Blackbirds eating the worms will be poisoned to death. We had the same idea on almost the same day 🙂 – across the indian ocean – http://ecofootprintsa.blogspot.com/2010/09/its-finally-spring-time-in-cape-town.html. I did it for insect / snail protection – only have a problem with birds going after our grapes. Would love to know how you sorted out the corn and tomatoes (and grapes) problem. @Dani: Cool, I like what you’re doing with the yard! I’ll post something soon(ish) about how I’m protecting my corn and tomatoes. I’ve got white netting over my tomatoes and hve eliminated the moth problem. I also use egg shells to deter the moths as they think one of their own is already laying their eggs there. However, I amstill getting snails munching away at my tomatoes and anything else they can in my vegetable patch. Nasturtiums seem to be one of the snails favourites and I have them planted to bring the bees and for brilliant colour. @Julie: Good ideas. I’ve never really had many snails in my garden, here or in our previous house. I wish I knew why!